St. John Evangelical Lutheran Church, known today simply as St. John Lutheran Church, was founded by 15 charter members on September 22nd, 1872. These original founding fathers were all of German descent. They were farmers for the most part and refugees from a homeland that had known religious strife for centuries. In Romeo, they found an opportunity to live in peace, prosper from their labors, raise families, and as importantly, exercise the faith of their forefathers. They were Christians in the tradition of Martin Luther and they were German Lutherans. The preservation of their German heritage created a strong bond that held these families together in a new country. Indeed, German was the primary language of worship and religious instruction until 1933 when Pastor E.G.Appel, who served St. John from 1932-1963, began using English on a routine basis. Up until then, we were the “German Church” as much if not more than we were St. John Evangelical Lutheran Church. So, we are a church with a rich history dating back more than a hundred years on American soil. Pastor Martin Gehring is the latest in a line of pastors leading us today into tomorrow’s history. Traditions change, ethnic backgrounds change, the physical appearance of the church changes. We are constantly changing with the pendulum of time yet we stay connected to our past. The first services of our church were held in the Sikes School in 1872. It is presently restored and on the grounds of Westview Orchard. The use of that location was brief and services were soon held in a building on Main Street in Romeo, known then as The Christian Church and now the location of Greg Tarr and Associates, a financial consulting business. In 1891, the site on Benjamin Street that we now occupy was purchased for $200 from the Village of Romeo. Formerly, it had been a gravel pit. 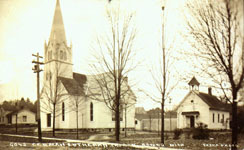 By 1892, a church and a parsonage had been built. No building project ever seems without contention and, despite common ancestry or perhaps because of it, some families left the church. Pastor Karl Lemster and his family were the first to occupy our parsonage. He served St. John from 1892-1914, and donated a marble baptismal font to the church with the inscription, “ZUM GEDAECHTNIS AN LOUISE LEMSTER, 5 APRIL 1900.” (In honor of Louise Lemster, his wife). It is the only baptismal font to be used in St. John since then. multi-purpose areas have been added in a 1.3 million dollar building project. We are no longer the church we once were to be sure, but in a sense we still like to see ourselves as a family, challenged to keep the Christian faith seasoned by the ideals of Martin Luther alive and growing in our midst even as we look to adapt to the secular culture in which we live. Perhaps the most important history of our church however, is not the interesting saga of ongoing change at St. John as it is the constant challenge to continue to grow as we are called to do while staying connected with a common theme of faith as confessed by Martin Luther and his followers. That theme is perhaps best illustrated by what has been called the Luther rose. In 1530, Martin Luther was presented a gift from the secular head of state and his protector, John Fredrick, the Elector of Saxony. The gift was a signet ring; a seal designed by Luther to summarize his beliefs and used perhaps to stamp and authenticate his writings. The seal became known as the Luther rose: it is a blue ground on which is a white rose within a circle; a red glowing heart lies upon the rose, with a black cross embedded in it. The cross symbolizes the sacrificial and dreadful death of Jesus on the cross. Faith and acceptance of the unconditional love, forgiveness, and salvation given to us through the life, death, and resurrection of Jesus Christ is the central reality of Christian life, thus the cross lies across the heart. It is the reality that makes one’s heart glow with joy and peace inspiring us to Christian service. The white rose reminds us of angels clothed in garments white as snow signifying that our joy is not of this world. The sky blue background indicates hope that we will experience an even greater joy in heaven; and the golden circle depicts eternity and the assurance of being in eternal fellowship with Jesus, our savior. All are consequences of the Christ-event, which was the focus of Luther’s life, his work and his theology, which he called the theology of the cross. The seal was a symbol that many Lutherans knew and wore as a lapel pin or emblem, much like wearing the emblem of a favorite sports team. It served as the stamp and seal authenticating a Lutheran. The 15 founding fathers of St. John surely knew this symbol well and were heirs of this history. Its substance served them well. We too inherit these same gifts and in the ongoing process of redefining and becoming who we are, will be wise to understand, preserve and learn from our history. We can be assured if we do, we too will be well served.